I am getting older and my resolution getting more weird! Ah! see the title enough to figure out how weird I can be.WTH!!! Recently, my kitchen sink clogging like mad!!! Water just don't goes down like normal....don't know where it gone wrong here??? I decided to settle this on my own. Yeah right!!!! like this woman got that 'motor skills' in her??? Since last weeks I tried to use 'super powerful' unclogged chemical but the attempt was bloody useless. I tried 'youtube'!!!! kekekeke internet can solve problem huh??? The plumber channel taught me to do volcano eruption in the sink using baking powder and vinegar. Oh!!! that volcano eruption???? It works and I really get that very fascinated eruption!!!! Did it really solve my problems???? It just the baking powder bubble and that was it!!!! Last night decided to do something I never thought I want or could do.....I opened up the 'L' shape joint underneath the sink. I thought the 'stubborn clog' trap at that part. Maybe if I tried to clean that part then the water can goes down smoothly. I opened up...that part and...Yeah!!!! the emergency flooded in the kitchen!!!! Lucky I prepared basin underneath to contain the water flow out from the sink. What??? That joint is clear and totally clean...yo!!!! IMA sat on study table trying to think hard on what gone wrong here. Trying to think back on what possible the system lay out underneath this sink. 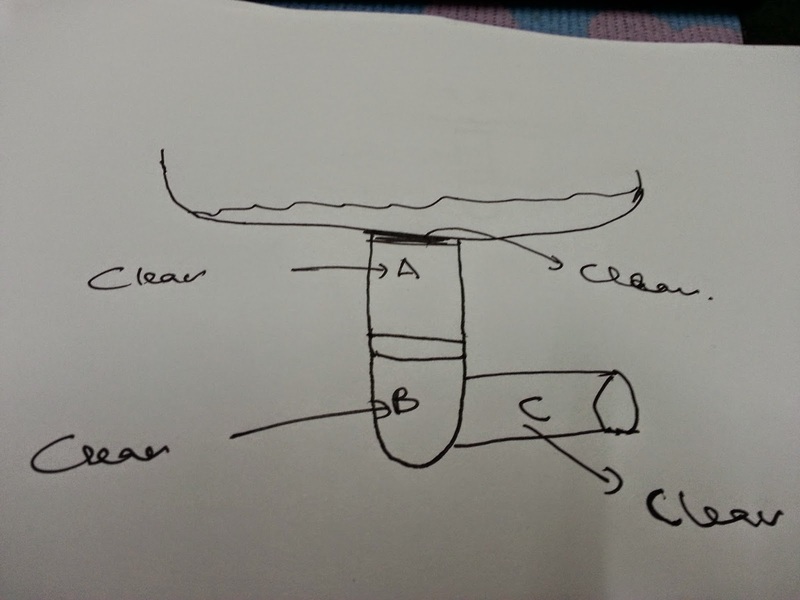 Using a lil bit of drawings skill..IMA is still trying her best to figure out the clogging part source! Chewwwaaahhh!!!! can draw now, ar this woman...huh??? WTH!!! huhuhuhuhuh...totally in Dilemma....shall I continue living without sink until I build up my courage to call stranger visit my 'habitat'???? Gosh!!!! my courage will take ages yo!!!! Move because of clog sink??? I am not that kind of person who run away from problem? For time being let me keep up my effort to be my own plumber!!!! This rare of me to do this kind of job!!! But I can open up the 3 parts of the sink and put it back is consider achievement to me!!!! hehehehehe...so happy just because of that ....although I still unable to solve the clog problems. Thank God the water is not the dirty one!!!! Whining this to Chingu...that fella also 'bo layan me' . Bad ! bad!!! Chingu said call the plumber la.... you ask me accounts I can answer you le...but this kind of job how I know????? True also la...how hell he know when he being raise like a 'flower boy'!!! WTH! Then went to office and whining again with another Chingu and that fella said 'bei tahan ar'. Call the plumber la woman!!!! That's the reply I received. Shall I change this post title to 'Just call the Plumber'??? Wise old woman were saying....'Think as simple as possible to live your life conveniently'. Which wise old woman said this huh? The one typing this entry lor!!!! mmmmm....but the risk exposure is too high to let stranger into the house. hye darling ,:) its been a while kan ? i jrg do blogwalking now . been busy with newborn and th big sister. take care dear . We have to live happily because life is short! you too be happy always!!!!! Then you need to ask from your friends which plumber is the real expert one.